I love it whenever CW returns from UK, it signals the advent of another fine dining experience. We paid a visit to The French Kitchen the last time she was back in March, so it was only apt that a visit to sister restaurant Saint Pierre was in the works. 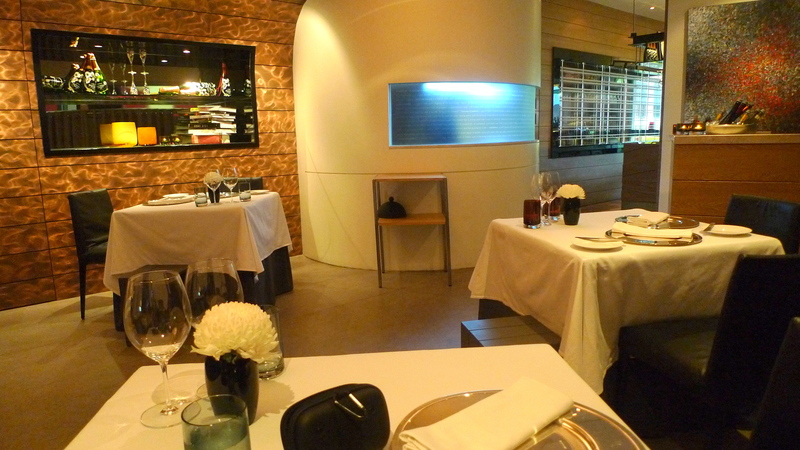 Helmed by Chef Emmanuel Stroobant (Chef of the Year 2002 & 2006), my lunch expectations were running at an all time high. 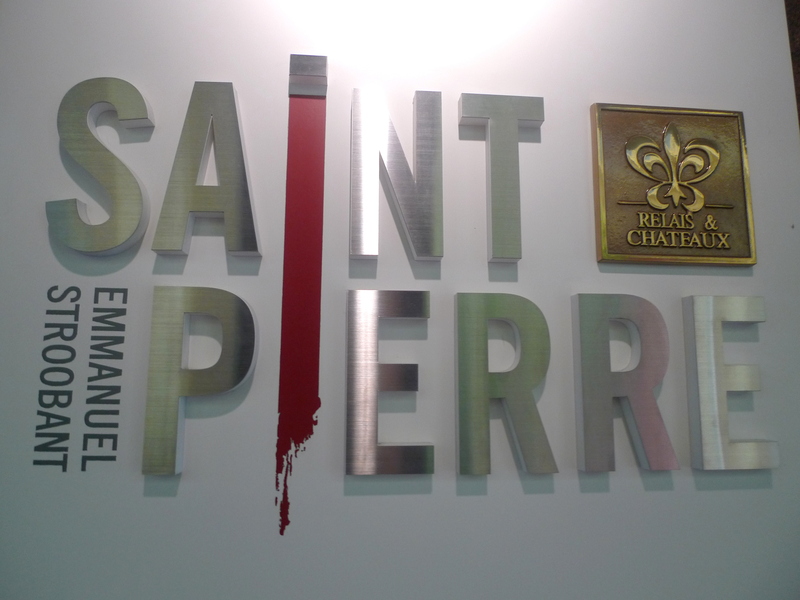 After all, he has been the driving force that has led Saint Pierre to strike gold in several dining awards, the latest being Restaurant of the Year 2007. In addition, Saint Pierre’s inception into Relais & Châteaux(a collection of the world’s finest hotels and restaurants) in 2008 has further entrenched it’s position as a leading entity in French Cuisine. Saint Pierre proved to be a chichi respite from the hustle of everyday school life. I arrived about half an hour before CW but I really wouldn’t have minded just loafing there the whole day since there’s free wireless available and the ambience is peaceful enough for me to go about my own business. There’s a sitting capacity of 60 for the entire restaurant and I felt that there was more than adequate space between tables to facilitate a private tete-a-tete. There are 3 options for Set Lunch here. $28++ gets you a Main + Dessert, $38++ gets you a Starter + Main + Coffee/Tea, while $48++ gets you a Starter + Main + Dessert + Coffee/Tea. 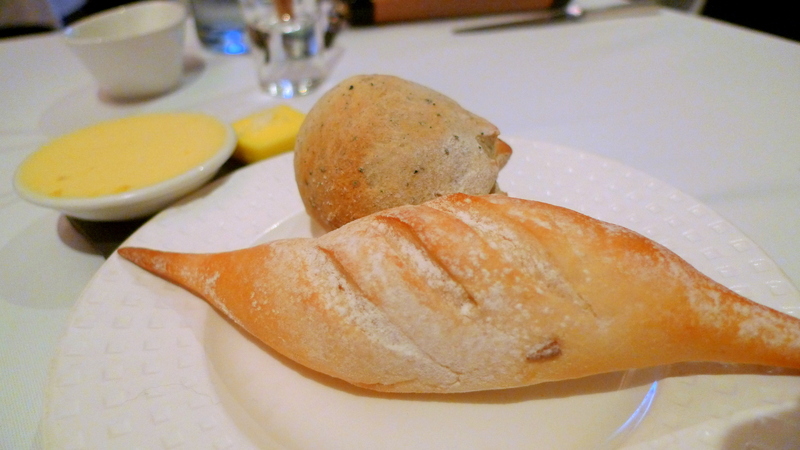 The complimentary Bread was served warm but I felt it was a tad too dry and tough. At least there was a choice of 2 different butters! Can’t remember what the staff said they were, just that one was salted and the other wasn’t. 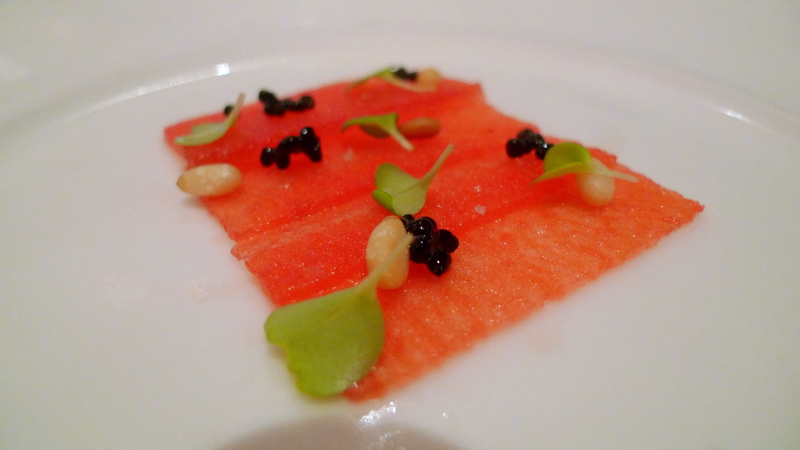 Our first complimentary Amuse Bouche was the Watermelon Carpaccio with Seaweed Caviar & some nut I can’t remember. An interesting pairing of sweet and savoury, CW and myself thought that this was a stroke of genius. Like how Sushi chefs skillfully cut sashimi into smooth regular strips, I must commend the skill required to cut the delicate watermelon flesh into razor thin strips. This was my first time eating Seaweed Caviar and though it tastes and “pops” exactly like caviar, I’m amazed to find out that it’s actually made from Seaweed, Cod Liver Oil & Organic Sea Salt. 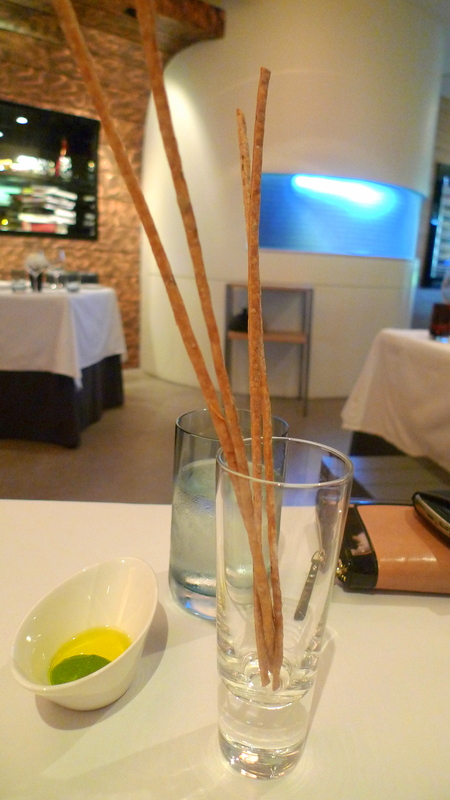 Our second complimentary Amuse Bouche was the Squid Ink Cracker. 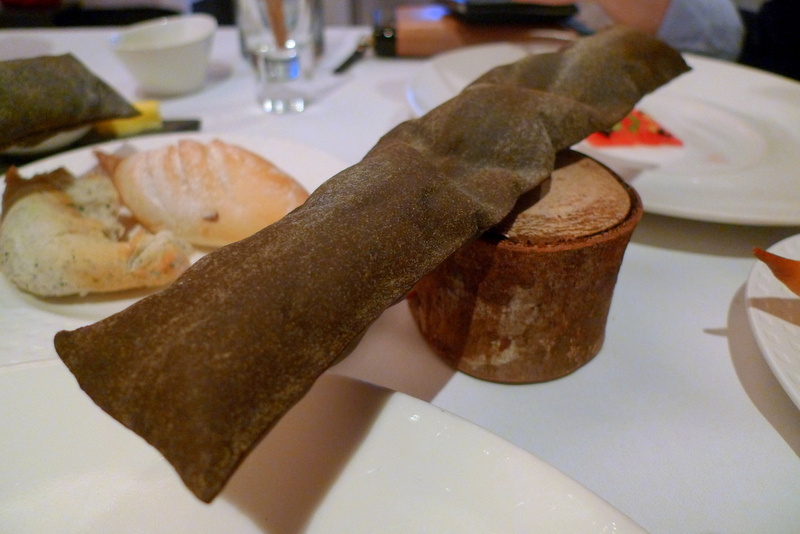 While I commend it’s novelty, it tasted somewhat like a chao tar(burnt) bread. CW & I both opted for the Classic Foie Gras(Additional $8) for Starter. 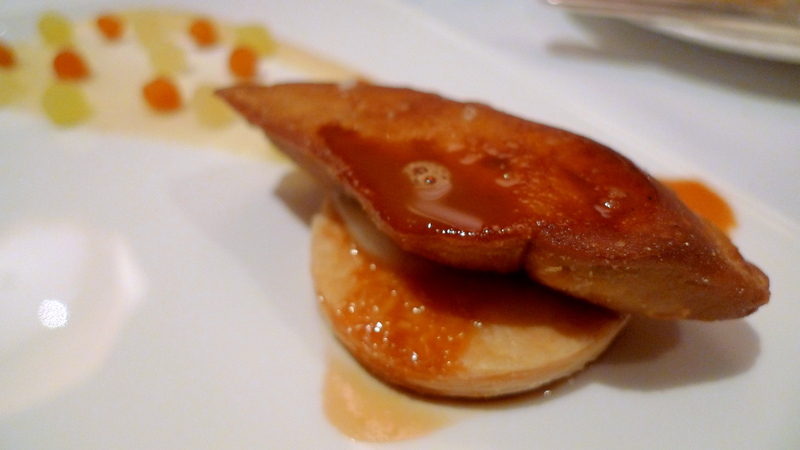 After all, what’s a French Fine Dining meal without Foie Gras right? Pan-fried with a side of Caramelized Green Apples & Old Port Sauce, the Foie Gras was executed decently well and it goes well with the accompanying sauce. I enjoyed it tremendously but CW who has a more refined palate having dined at a number of Michelin Star Restaurants around the world wasn’t quite as taken by it. For Main, I had the White Miso Cod, which is a popular choice among patrons. 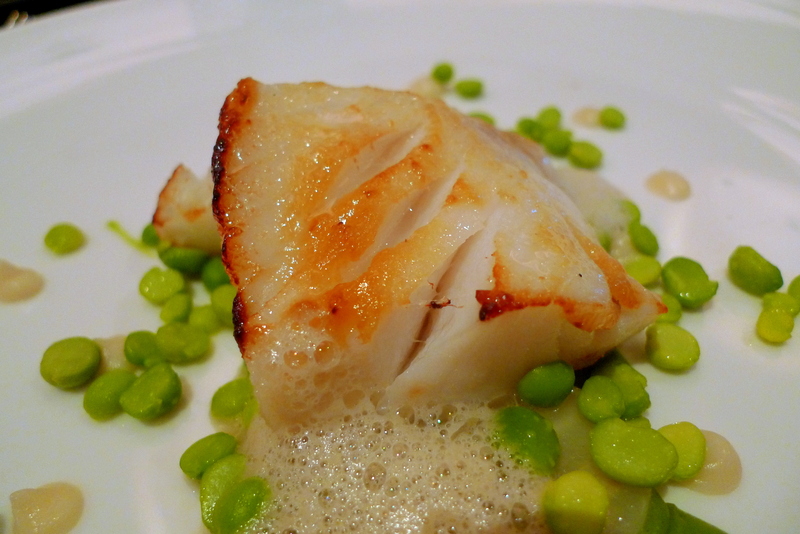 The description reads “White Miso Marinated Black Cod with Celeriac Puree, Fresh English Peas & Japanese Eggplant Emulsion” and it was nicely done with the White Miso infusing and complementing the Cod well. Not the most exciting of dishes but it’s a safe bet. CW had the Wild Mushroom Risotto for Main. She didn’t think much of it either but I thought it was lovely. After all it’s a vegetarian main! What more can you expect? Yes I admit I’m a foodist (the food version of sexist), and I stereotype vegetables as being icky haha. 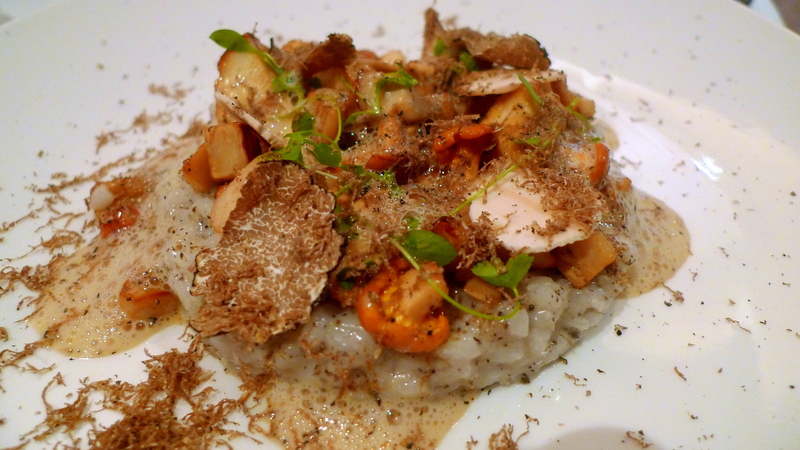 Anyway, I loved it perhaps because I’m a fervent mushroom lover and the truffle shavings were pretty generous indeed. I think Singapore lacks good Risottos and that’s why my standards for them might be a bit low. A pungent smell of stale socks wafted by and I couldn’t help but check if I had stepped on dog poo. 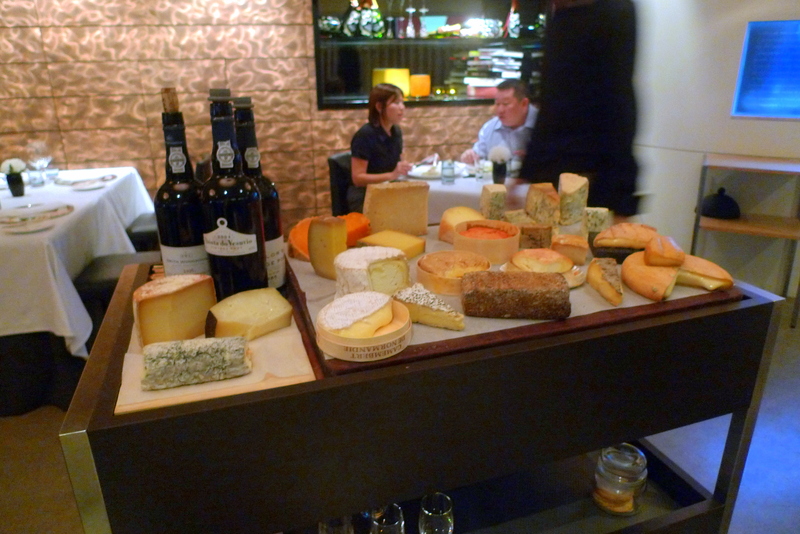 Not exactly the best description for a cart of cheeses which we were entitled to sample, but we declined the offer. Singapore doesn’t really have a strong cheese culture anyway, probably because of our high humidity and temperature which makes it more difficult to store cheese properly. For Dessert, both CW & I had Grandma Stroobant’s Flourless Belgian Chocoate Cake with Dark Chocolate Mousse, Praline Ice Cream and Toasted Almonds. We found the cake too dense and cloying but eating it with the ice creamed helped. 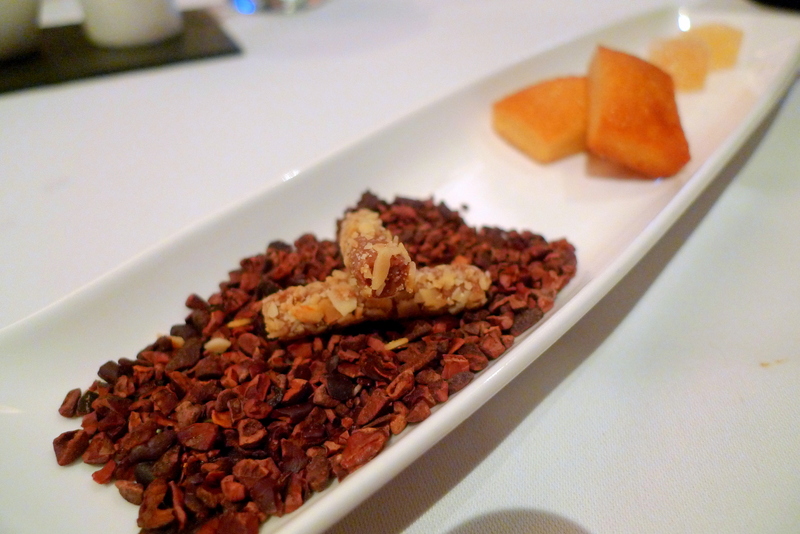 The Praline Ice Cream was probably the only highlight of this dessert. Just when we were prepared to call it a day, a complimentary platter of Petit Fours was served, consisting of chocolate truffle, some kueh tasting cake & lemon fudge (all names given by me because I couldn’t remember what the staff said it was). 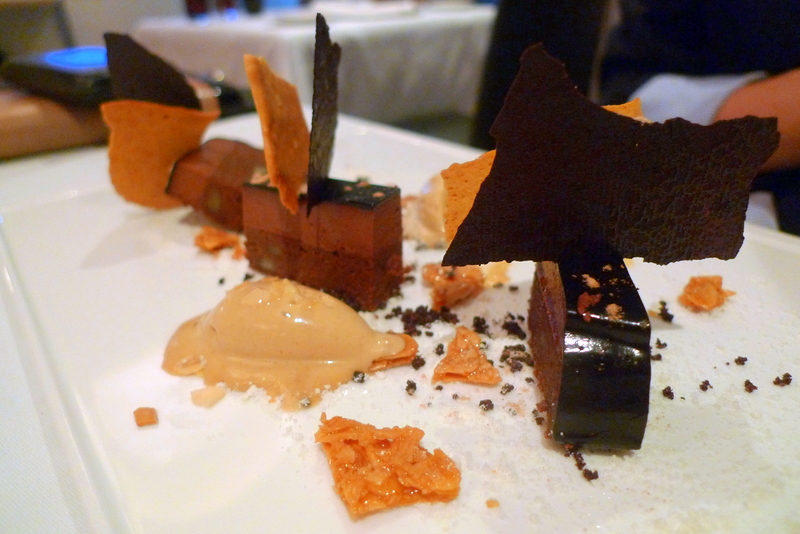 An epicurean experience? Hardly. The food definitely wasn’t bad and I enjoyed myself, but we felt that the food lacked the finesse (at least taste-wise) expected of a top restaurant. Categories : All YumYums in my TumTum, Chichi, Clarke Quay, Cuisine Type YumYums, French, Location of YumYum, Yummy!